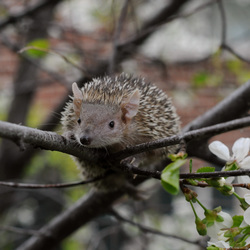 In the past, lesser hedgehog tenrecs have been classified as "regulated" in Utah, meaning a COR permit would be necessary for anyone to own a tenrec. We requested our COR permit in early 2014, and were granted the permit by August. As soon as we brought our boy Romulus home, we knew we wanted to share tenrecs with others in Utah! In the fall of 2014, we began working to make it possible for anyone in Utah to own a lesser hedgehog tenrec-- no permits required. We submitted the request for reclassification, dug through studies and data for hours to supply the state biologist and other representatives with the correct information, performed phone interviews with board members, and stayed in constant contact with our wonderful contact at the Department of Natural Resources. On August 27th 2015, a full year after we first began our journey, we (Romulus included) attended a board meeting for Utah's Department of Natural Resources. 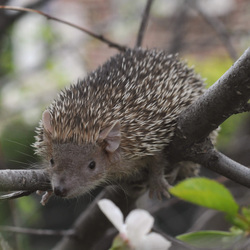 Romulus immediately charmed the board, and it was unanimously voted that the lesser hedgehog tenrec be reclassified from "regulated" to "non-controlled", meaning that COR permits would no longer be necessary! On October 11th, 2015, tenrecs were officially reclassified. We are so grateful for the support from our friends, family, and the hedgehog and tenrec community through this long process, and we are excited for what this means for us here at Storybook! 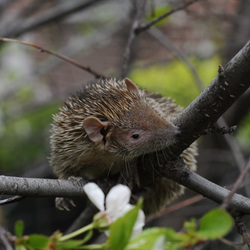 Tenrecs reproduce once a year, typically in spring, starting at the age of 2. We hope to be able to have little tenrec babies toddling about our home starting in the spring of 2017! We are so deeply in love with ours, and we are ecstatic at the idea of being able to share that with others! Little Romy is the one that started it all! This handsome boy has such delicate features, we thought he might be a girl for a minute there. 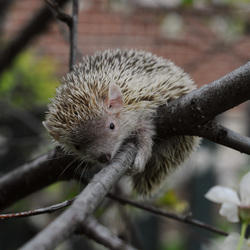 He is from our dear friends over at Volcano View Hedgehogs, who introduced us to tenrecs first. He is the most laid-back and easy going little critter we've ever met, and enjoys keeping me company while I sew as well as sleeping on my daughter's lap during cartoon Saturdays. He has our family smitten! This handsome little "silver fox" is Prometheus, aka Theo. He is more of a one-person tenrec, and while he's okay being handled by others, he seems to prefer his mama's company the most! He's from a wonderful retiring breeder in Colorado (her last tenrec baby ever!) and we couldn't be more grateful for the opportunity to bring this little one into our home. Adorable little Hestia is also from Volcano View Hedgehogs, and we're so excited about her! She will be Theo's mate, and they will be such a charming pair. She is very active and curious, and climbs faster than you'd expect for such a petite little thing. Unfortunately, her nickname is not remotely as pretty as she is-- when asking our three year old for name suggestions, she immediately responded with "Ploppy". Though we decided on Hestia as her official name, we have found ourselves referring to her as "Ploppy" without meaning to. We love our sweet girl! This adorable little snuggler is from Needlework Hedgehogs, and we're absolutely thrilled to have her. She is very laid back and friendly, and is born for cuddles. Juno's nickname seems to have chosen itself as well-- her breeder used color spots to differentiate the babies in a very large litter, and Juno here was pink. Before we'd picked her name, we just called her "Pinkie"! We are looking forward to meeting the gentle little "tenlets" that she and Romy produce together.